Ìgò ògùn alábùkún àmínìamáralókun B alágbára gíga. Àmínìamáralókun (fítámínì UK /ˈvɪtəmɪn/) is an organic compound and a vital nutrient that an organism requires in limited amounts. An organic chemical compound (or related set of compounds) is called a vitamin when the organism cannot synthesize the compound in sufficient quantities, and must be obtained through the diet; thus, the term "vitamin" is conditional upon the circumstances and the particular organism. For example, ascorbic acid (one form of vitamin C) is a vitamin for humans, but not for most other animal organisms. Supplementation is important for the treatment of certain health problems, but there is little evidence of nutritional benefit when used by otherwise healthy people. ↑ Lieberman, S and Bruning, N (1990). ↑ Fortmann, SP; Burda, BU; Senger, CA; Lin, JS; Whitlock, EP (12 Nov 2013). 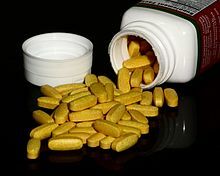 "Vitamin and Mineral Supplements in the Primary Prevention of Cardiovascular Disease and Cancer: An Updated Systematic Evidence Review for the U.S. Preventive Services Task Force". Annals of internal medicine 159 (12): 824–34. doi:10.7326/0003-4819-159-12-201312170-00729. PMID 24217421. Àtunṣe ojúewé yi gbẹ̀yìn wáyé ni ọjọ́ 24 Oṣù Kàrún 2015, ni ago 08:52.